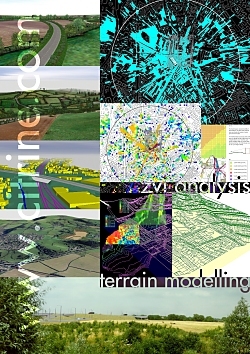 The Use of terrain modelling to assist site design and local planning has been much overlooked. In many cases we are asked to do a ZTV analysis or create photomontages for a development, which may be unsympathetically designed located in the landscape, particularly new housing. A predictiuon of the landscape's capacity to 'absorb' new development allows a better design approach, rather than having to mitigate for problems later. The cost saving of this to developers is not only in building but in consultancy fees and planning too. With a simple landform analysis shows where buildings will have least or most visual impact, so where to concentrate low rise development for minimal impact, and where is the best place to site a landmark. We can 'grow' boundary vegetation and show the effects of mitigation, mounding and tree planting, to demonstrate the reduced impact over time. 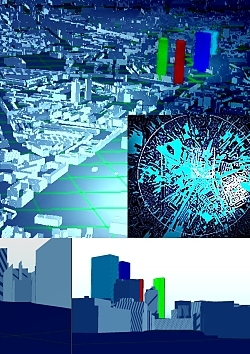 Typically we might show a 5, 10 or 15 year scenario which helps develop a phased construction programme as well as inform the ultimate maximum visual capacity of the area. The information we store in the results isn't simply a contour overlay, although this is arguably the most compelling result. 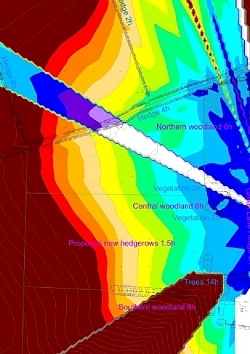 It also tells us which particular viewpoints are limiting the site's capacity most, and therefore how to develop cost effective mitigation and phasing strategies.